It’s not just homeowners who can benefit from solar PV and businesses should take advantage of the financial savings solar panels offer too. Businesses tend to have a far greater electricity bill as it is, so utilising a natural source and generating your own free energy is a great way to start slashing your expenses. Just like solar panels for your home, a PV system for your business will be installed on the roof of a building, probably facing south or southwest. This is to ensure the panels receive optimal sunlight and generate more electricity throughout the year. Two layers of semiconducting silicon convert sunlight into electricity and this can then be used to power lighting and appliances. With solar power you’ll be able to save hundreds or even thousands of pounds every year. Generate free electricity for over 25 years. A solar panel system will last for more than a quarter of a century. 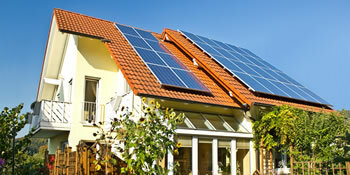 This is backed by solar panel installers who even offer guarantees and warranties for up to 20 years. Take advantage of the lucrative income earning potential of the feed-in tariff. The tariff rewards the uptake of renewables by paying out a set rate for every unit of renewable electricity produced. This guarantees a high return of investment over a 20 year period. Avoid paying even more on your energy bills as wholesale prices rise for gas and electricity. Using a natural resource will protect your business from an expensive future. Make a further earning by selling any excess electricity to the National Grid. Whilst most of the electricity will be used for your business needs, anything unused can be sold at a set rate. Run solar panels with low maintenance needed. Solar panels run efficiently for years and years without a hitch. All you need to do is ensure they’re not cast in shadow by trees or buildings. Cut your business’ carbon footprint by using a renewable source and lowering dioxide emissions. This will help the environment and also aid the Government in meeting 2020 targets. If you want to cut the expenditure of your business, then solar panels could be the solution for you. They allow you to cut your spending whilst also guaranteeing a fixed income over 20 years. Simply complete our quick form and we’ll provide you with up to four FREE quotes from local, vetted and reputable solar panel installation companies. Project: Please can you send through information for a commerical glamping site. Awaiting appointment but looking promising. Comprehensive technical detail but 30% higher than another quote received. Therefore, waiting for 3rd quote to see how they compare to one another. Apart from providing companies to quote, they were very good at following up on progress and chasing companies where necessary. You asked questions to ascertain the background to what was being sought and nominated potential contractors, one of whom got in touch.